A Somali widow, mother of two Amina has recounted her horrific ordeal after falling into the hands of Libyan traffickers. 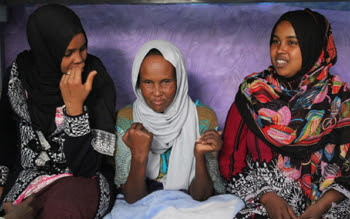 After more than a year of relentless beatings and electric shocks, she is now broken and unable to walk.”When I arrived in Libya, I was walking, nobody had to help me … but look at me now,” she says, holding up her badly broken arms in despair, her legs paralyzed. The 42-year-old woman from Somali is among thousands of refugees and asylum seekers from across Africa who set out on desperate journeys in search of safety, who all too often end up the captives of ruthless human traffickers in Libya.